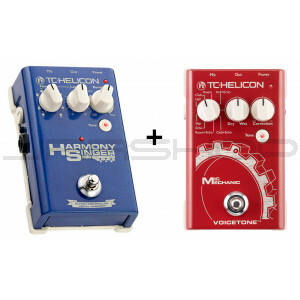 TC-Helicon is proud to announce Harmony Singer – the second pedal in a new series that started with last year’s hit product, Mic Mechanic. Harmony Singer is a professional multi-effects unit that operates with the simplicity of a guitar stomp box offering three key features: Guitar-controlled vocal harmony, Tone and Reverb. It is aimed at all guitarists wanting to add accurate backing vocals and pristine reverbs to their repertoire. Mic Mechanic gives you a complete vocal toolbox in a compact, easy-to-use pedal. Take it anywhere and always sound your best. Reverb is the most essential vocal effect, used in practically every venue and recording studio in the world. Picked from the flagship VoiceLive series, the lush Reverbs in Mic Mechanic surround your voice with a great sense of space - small or large. From short slapback echoes to long repeating phrases, Delay adds that special "something" to your vocal sound. Use the Tap Tempo feature and time the delays to match your music perfectly. Auto Chromatic Pitch Correction gently guides you towards the "true" note you’re singing. When you're just a bit flat or sharp, Mic Mechanic steps in and gives you a little - or a large - nudge in the right direction. It can be transparent or used as an effect, whichever you like. Mic Mechanic dynamically adjusts EQ, Compression, De-Essing and Gating - providing you with great tone all the time. Get a great vocal sound regardless of your sound system or sound tech.